I’m usually pretty excited when that email drops into my inbox confirming my Glossybox has been dispatched, hoping that maybe I’ll get a product that I’ve been dying to try or will discover something new and amazing. However this month I was ridiculously excited about receiving my Glossybox. So why was I so excited this month? Well last week I noticed some tweets popping up on Twitter saying this months box was amazing and one of the best they have done. Usually I avoid any spoilers that appear on Twitter before I’ve received my box to try and keep my possible contents a surprise, but this time I just couldn’t resist taking a peep at some of the pictures and blog posts that appeared. I discovered that there was three products that I REALLY wanted to receive in my box, so I crossed my fingers (and toes and anything else that will cross) and waited for my box to arrive. 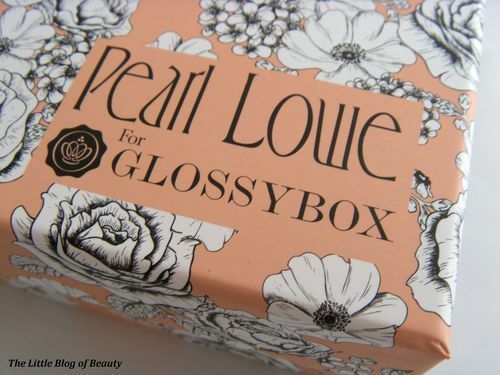 This months box features a special vintage floral design by singer-songwriter turned designer Pearl Lowe. The box is very pretty and I’d like to see them do more collaborations like this in the future. So, on to the contents…. I’m happy to say I received two of the three products I was lusting after which I’m really pleased with. I’d probably have cried if I didn’t receive any of them! Nip + Fab Pistachio Sundae Dry Skin Body Butter - This was the first product that I really wanted. I know that this body butter is available in a few different flavours, and I would have been pleased to receive any of them, but I was hoping to receive this one because I know how amazing it smells. This sample contains 50ml and is worth around £2.50. Essie Nail Lacquer ‘Nice is nice’ - This was the second product I really wanted. I only have one Essie nail varnish that I haven’t actually tried yet because it’s a very dark colour and a little too dark for me so I was hoping to receive this in a lighter shade. I wasn’t too sure about the colour I received as I’m not a fan of pastels but I actually really like this. This is a full size product worth £7.99. Sunsense Daily Face SPF50+ - At first glance I thought this was an Olay product but on closer inspection I realised it’s actually a brand called Sunsense. This appears to be a sunscreen for the face and neck which contains a tint. I’ll be interested to try this but I am a bit concerned about the packaging as it looks like you have to break the end off to open it and I’m not sure if you can then seal it again securely. This contains 10g and is worth around £2.50. Modelco Cheek + Lip Tint ‘Rosy red’ - I recently received a Modelco eye shadow in a previous Glossybox so I have come across this brand before. This product appear to be similar to Benetint but whereas Benetint is a liquid this appears to be more of a gel. I have to admit I’m slightly apprehensive about trying a tint product but I will give it a go. This is a full size product worth £15. Yves Rocher So Elixir Purple Eau De Parfum - As I believe I may have said before I’m not keen on perfume samples in beauty boxes because you can pick these up for free. However this is actually quite a generous little sample and it comes in a little mini bottle so I think this is an improvement on the samples you usually receive. This sample contains 5ml and is worth around £4.40. At around £32 worth of products and samples this isn’t one of the highest value boxes I have received, however I am really pleased with the contents. In case you were wondering about the last product I was lusting over but didn’t receive, this was an Illamasqua pencil. I’m already a big fan of Illamasqua so I would have loved to have received one of their products for free (yes I know I paid for the box but I still kind of see the products as being ‘free’ if you understand what I mean). 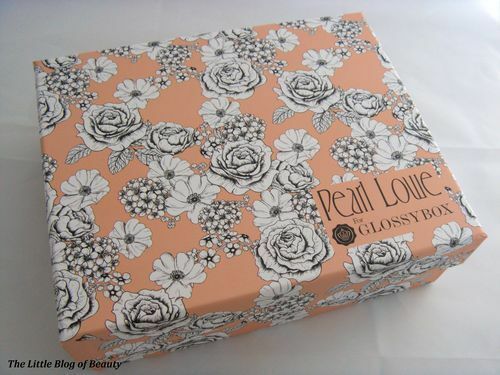 The Glossybox website hasn’t been updated yet with the all the products that were available in the April box, so there may be other products I would have liked to have received, but in general I am very pleased with this box.